HARLEM — Manhattan’s first and only dog park in a domestic violence shelter opened in Harlem Tuesday. 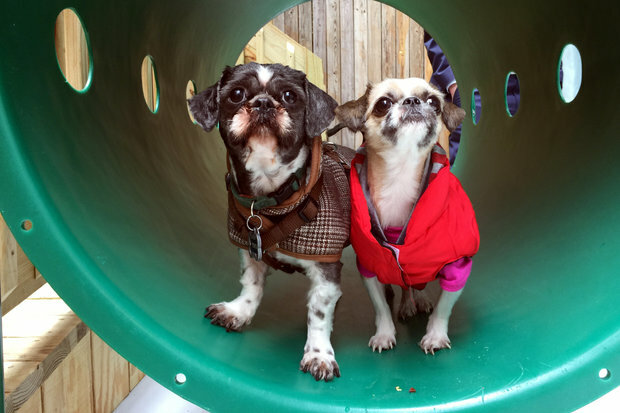 The Purina Pet Haven is a backyard space with artificial turf, wooden stairs, play equipment and water for the dogs of domestic violence victims living the Urban Resource Institute shelter, the only one in the borough that allows survivors of domestic crimes to move in with their pets. “For those of us that have pets knowing that you have the support that you need moving forward, imagining your life with your pet children, there is really nothing that can describe that," said Jasmin, who has two dogs. "To be able to see that they have beds and toys and food it gave me a little bit of extra strength to see myself through the next day." DNAinfo is withholding Jasmin's last name because she is a resident of the shelter. The park creates a safe environment for people who are uncomfortable walking and playing with their pets in the street. Almost half of domestic violence victims stay in an abusive situation for fear of what will happen to their pets if they leave, said Kurt Venator, director of veterinary strategy and programs for Purina, which funded the park and donates animal equipment to people moving into the shelter. Of the people that do leave their pets behind in violent domestic situations, 70 percent said their pets have been threatened, hurt or killed by their abuser, he added. “The need for this shelter and this program is clear,” he said. The opening of the doggie park comes in the eve of a Urban Resource Institute report looking at co-sharing and the connection between domestic violence and pets. The doggie park is part of URI's PALS — people and animals living safely — program. Since 2013, they have helped 43 families and 63 pets, said president Nathaniel Fields. They hope to be able to expand the PALS program into all of their shelters in the future, he added. Supporters of the program, including State Assemblywoman Linda Rosenthal, would also like to see the program in more shelters. “I’m excited to see this model move throughout the state and throughout the entire country,” she said. After the ribbon cutting ceremony, Jasmin was able to enjoy to park with Tony and Teresa, her Shih Tzus. Both of them were dressed for the occasion. Tony, 5, wore a professor’s coat and Teresa, 4, wore a custom-made jean skirt and a red vest.